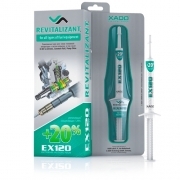 Gel-Revitalizant for Diesel Engines is designed for protection of engine parts from wear-out and restoring repair of diesel engines without disassembling. As a result a renovated unit exceeds the performance level of a new one and will serve you 2-4 times longer. Step 2: Repeat the Step 1 after 62-155 mi. Step 3: Repeat the Step 2 after 62-155 mi. Do not change oil until the end of the processing! Noticeable difference after 100 miles, Great product. 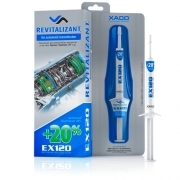 I ordered the Xado Diesel Engine Revitalizant blister packs. Good results, excellant service, well packed and delivered promptly. Will certainly use this product again. 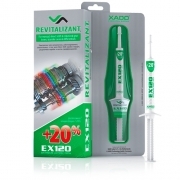 I have used the Xado Diesel Engine Revitalizant Gels before so I know it works. I would recommed Xado to anyone. An excellant product that does what it says on the tin! Many thanks. I wanted to provide feed back as I am very pleased :) with the results I achieved after adding 3 tubes of Xado Diesel Engine Revitalizant blister packs. Apart form a smoother ride my fuel consumption has improved by approx 1.5 mpg. I have used other additives and was unsure of the claims made by XADO. I have already recommended it to my family and friends as I am more than satisfied with my results and will at some time be using their gearbox additive. Fantastic service good product. I have been using the diesel treatment for 3 years and I never stops to amaze me. Well done Xado. Excellent product I have used it on two vehicles now. The first time was on a diesel engine 2.4 ltr 6 cylinder and it really surprised me I thought it was more unfulfilled promises I was Wrong Brilliant gear. l have also used it on our Galaxy Petrol engine again brilliant.